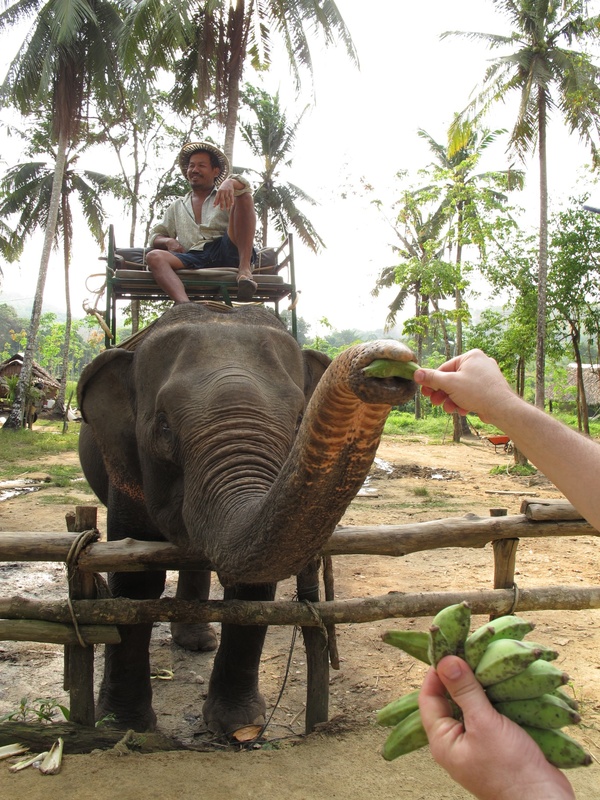 Phang Nga, Thailand–How do you mount an elephant? It is not, as you might imagine, a conundrum I’ve often considered, but as I survey the vast acreage of a 6,500 pound female at an elephant camp in Phang Nga, I realize this is not going to be a walk in the park. In fact, it’s supposed to be 90 minute-long ramble along a dirt and gravel road threading through a rubber plantation a few miles inland from Thailand’s famous golden beaches. A mahout—as the elephant guides are known—makes it look easy, of course. How do you mount an elephant? Well, you can wine her and dine her and take her to a movie–or skip the courtship and simply scamper up one of these wooden structures to hop in her basket. Using the animal’s bended knee as a step, he’ll swing himself up, Tarzan-like, with a rope. 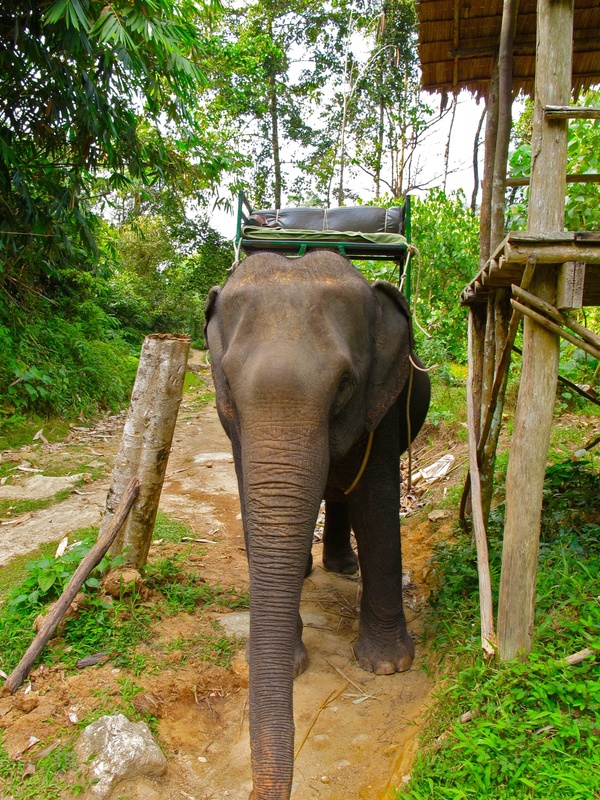 Fortunately for greenhorns like myself, Sairung Elephant Camp—where half a dozen mahouts squat in the shade of primitive huts, their laundry flapping damply in the humid breeze–provides a wooden platform the approximate height of the elephant, allowing you to step right onto the back of your ride. My husband, Scott, sensibly ensconces himself on a bench strapped upon the back of our lumbering beast, Boa-Thong (which I believe is Thai for “tiny underwear”), and while it would easily accommodate two, I’ve decided I want the “real” experience, riding on Boa-Thong’s neck. Gingerly, I scoot forward until I’m planted just behind her ears—and instantly regret it. I’m a long way up, and there’s nothing to stop me from pitching forward, except my own sweaty palms gripping the animal’s forehead, which is firm, spongy and unexpectedly bristly—a bit like a porcupine buttocks (if indeed porcupines have buttocks). Then we’re off, Boa-Thong’s shoulders rolling rhythmically beneath me with each step, as our mahout, Leim, follows on foot. Every so often, he pauses to gather Boa-Thong’s cannonball-sized dung deposits, using the soles of his plastic flip-flops to fling the droppings into the foliage. (Not for a million dollars would I walk a mile in his shoes—literally or figuratively). On the left, tall rubber trees line up in orderly rows, tapped low on their trunks to gather sap. On the right, fields stretch out towards a tangled ridge of jungle. It feels like a world lost in time, rooted in some past century, an impression that’s reinforced when we approach a humble home topped by a rusted tin roof behind a twig fence. An old man in a sarong, as lean, dark and knotted as a sapling tree, reclines outside on a bench made of bleached planks next to a young girl who is clutching…a mobile phone. It’s almost as disconcerting as discovering Gilligan punching up Google Maps on his iPad to find his way home. At the end of the road, we dismount via another tall platform and hike a short way for a gander at a modest waterfall, with a sign in English emphatically, albeit politely, requesting “Please Do Not Swimming!!! (This water for water supply. )” Then we climb back aboard Boa-Thong, with Scott on the elephant’s neck and me feeling much more secure in the seat. It’s all part of a daylong guided excursion arranged by the Sarojin Resort, which involved a morning jungle canoe safari and catered picnic lunch beside a waterfall, with the elephant ride as our grand finale. This is actually the second elephant camp we’ve visited today. At the first, Win in Khao Sok National Park, we had the opportunity to examine a stable filled with elephants, resting between their travails. 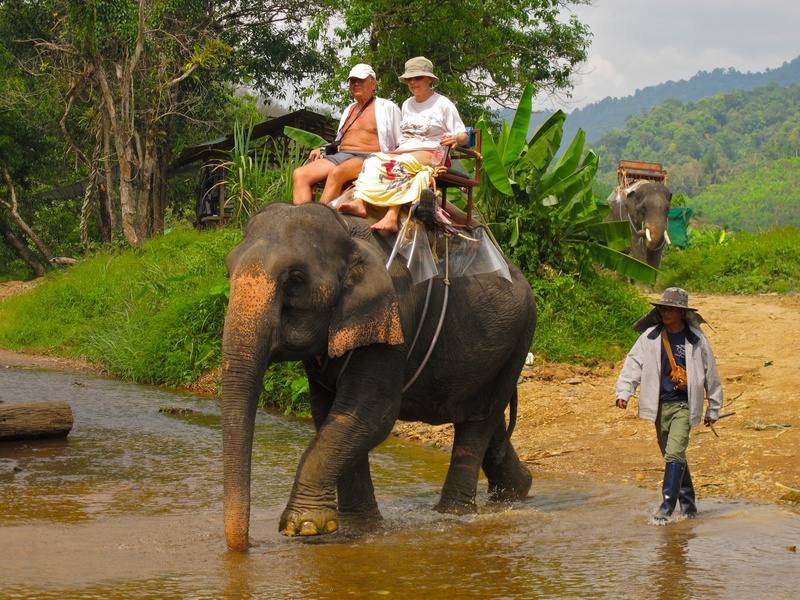 But Win was packed with busloads of tourists, and while a ride there would have afforded the opportunity to splash through a river high atop one of these incredible creatures, an hour-plus wait seemed unappealing. The scenery at Sairung might lack some of the drama of the park, renowned for its limestone peaks, but it is considerably more laid-back. 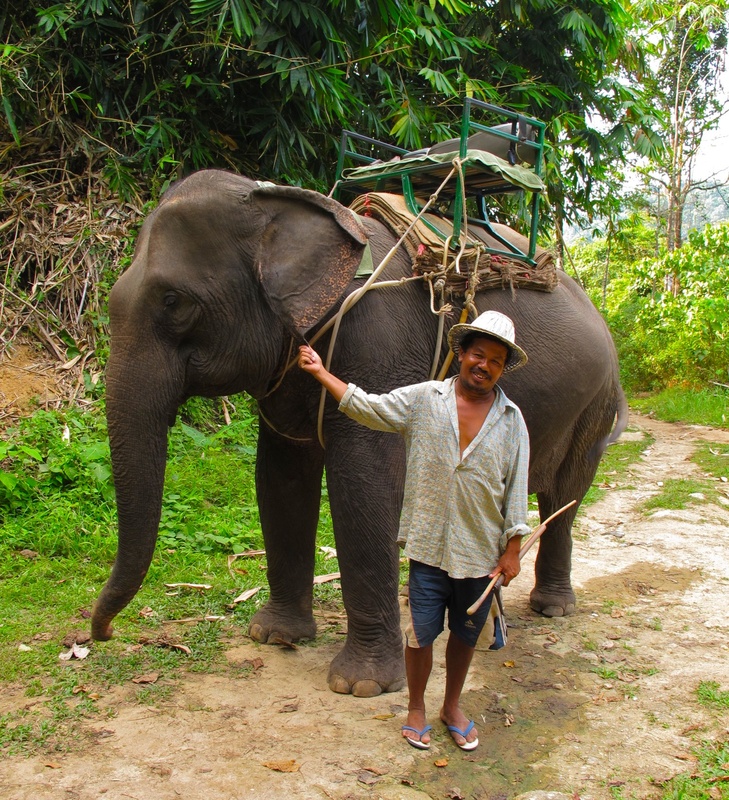 We only encounter two other elephants along our path, as Sairung is a small family operation. What do you feed a 6,500 elephant? Whatever it wants (but mostly bananas). 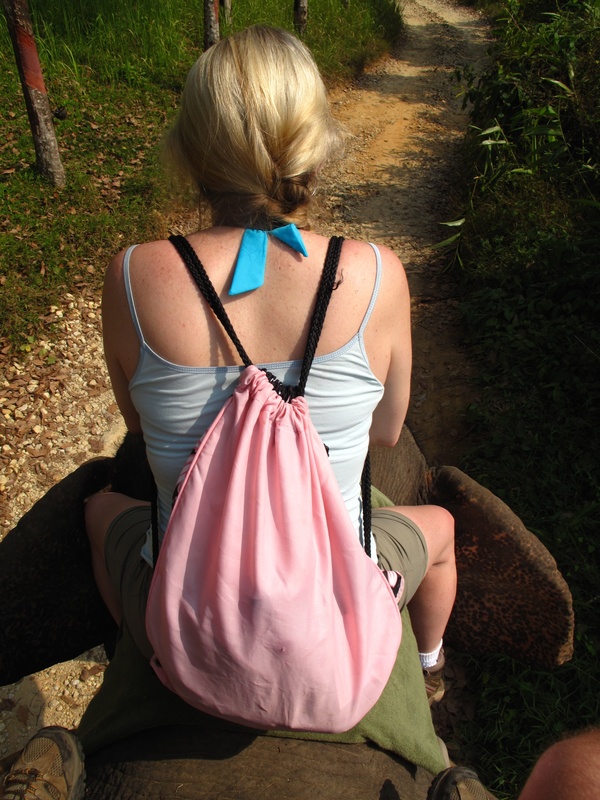 Returning to the camp, we reward our leathery steed with small green bananas, which Boa-Thong plucks delicately from our hands with her long, prehensile snout, shoveling them into her mouth peel and all. “Jaew” Thanita Kumphetch, a petite, soft-spoken woman who runs the elephant camp with her father, tells us that the animals eat up to 550 pounds per day. Having grown up around elephants, Kumphetch clearly harbors a great affection and respect for them. She recalls the day her grandfather died, and someone had to break the news to his favorite beast. “The mahout go to talk to the elephant, and the elephant make a noise and he cry, because he know,” she says. She worries that, when her father retires in a few years, she’ll have to give up the camp, along with the two elephants that her family still owns. “But if I can’t take care of them anymore, I can take them to the king in the north of Thailand,” she says, her face brightening. “He has a hospital, free for every elephant.” Surgeons at the hospital even designed a prosthetic leg for one unfortunate juvenile, which lost a limb when it stepped on a land mine. Looking into Bao-Thong’s tiny brown eyes, blinking contentedly as she gobbles yet another banana, I’d like to think that one day she’ll enjoy a leisurely retirement at the pleasure of the king, knitting afghans, playing canasta, and complaining about arthritis in her trunk. 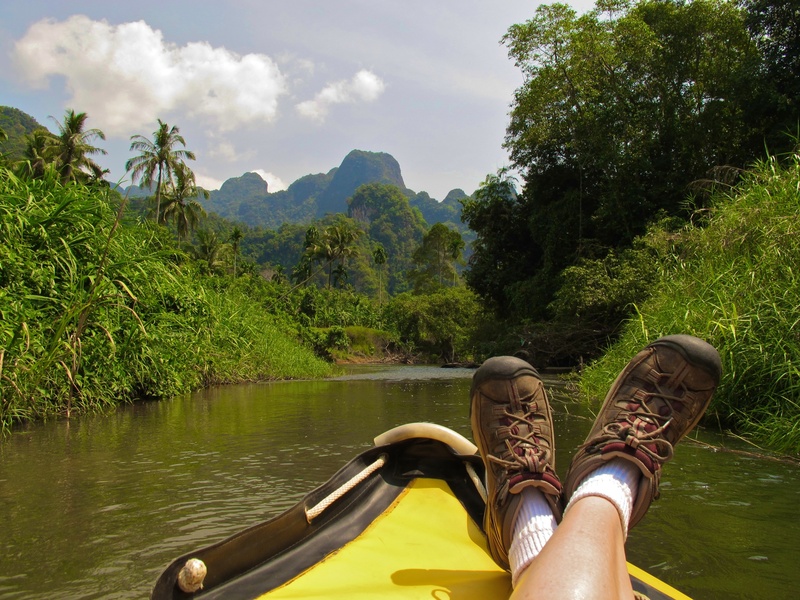 Where to stay: The Sarojin, Phang Nga, Thailand, www.sarojin.com. 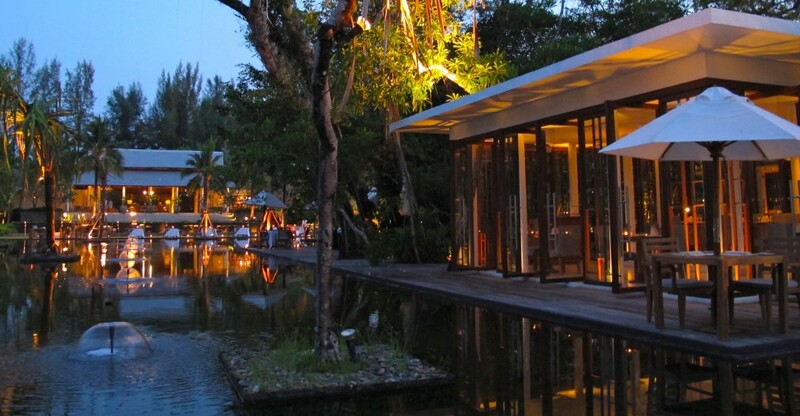 Located about 90 minutes north of Phuket, the Sarojin features 56 accommodations—many with their own pool–scattered across ten acres of gardens abutting one of Thailand’s silkiest beaches. 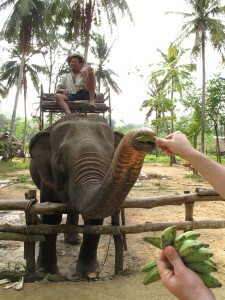 The resort can also arrange excursions, such as an elephant ride. Check with the resort for package rates. Amy Laughinghouse, December 15, 2013. No Comments on One Sweet Ride: Forget flat tires. Just hold onto your (Boa) Thong. .	Category: Islands and Beaches. Tagged: "The Sarojin", Thailand.